August 21, 2017 was a big day for most of the country with a very rare total solar eclipse visible across much of the country. In Cary, North Carolina, we only achieved about 95% of totality, but it was still an opportunity to test some basic optical principles and photography skills. So I set up a pair of 10x power binoculars as a projector and was pleasently surprised at the details I was able to photograph. Even from the first photograph, a line of sunspots could be seen across the orb. The gear is nothing special. 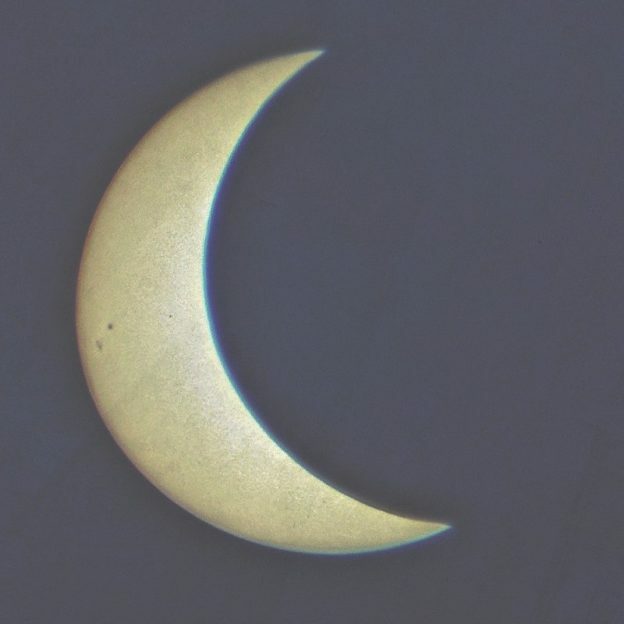 All of these photographs are of the image projected through the binoculars onto a white piece of paper and are taken with a Nexus 6 smart phone. 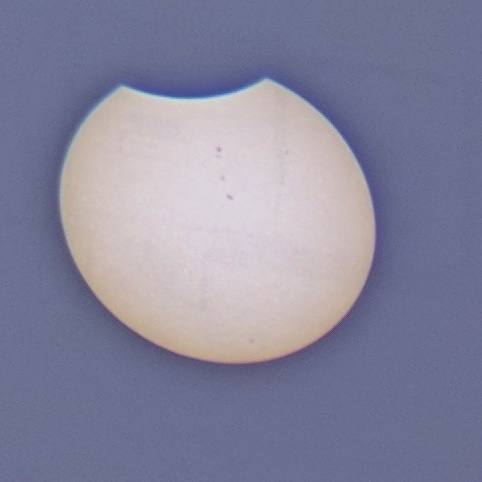 About half way to totality, a strange redness in the sky was obvious to several of us observing the event. Despite the short shadows from the midday solar position, the sunlight appeared as if at the end of the day. A significant diminishment of the radiative energy was obvious, too, and everything felt much cooler despite the continued glare. 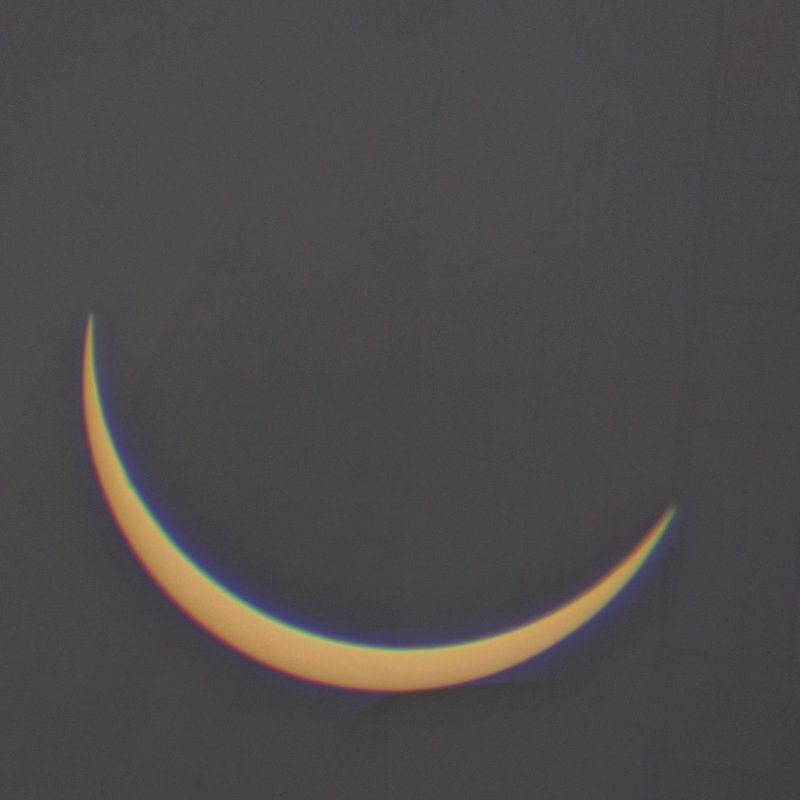 2:44pm was the maximum pnuembra (shadow) for the photograph above. You can barely see the last sunspot grazing the edge of the moon's edge. 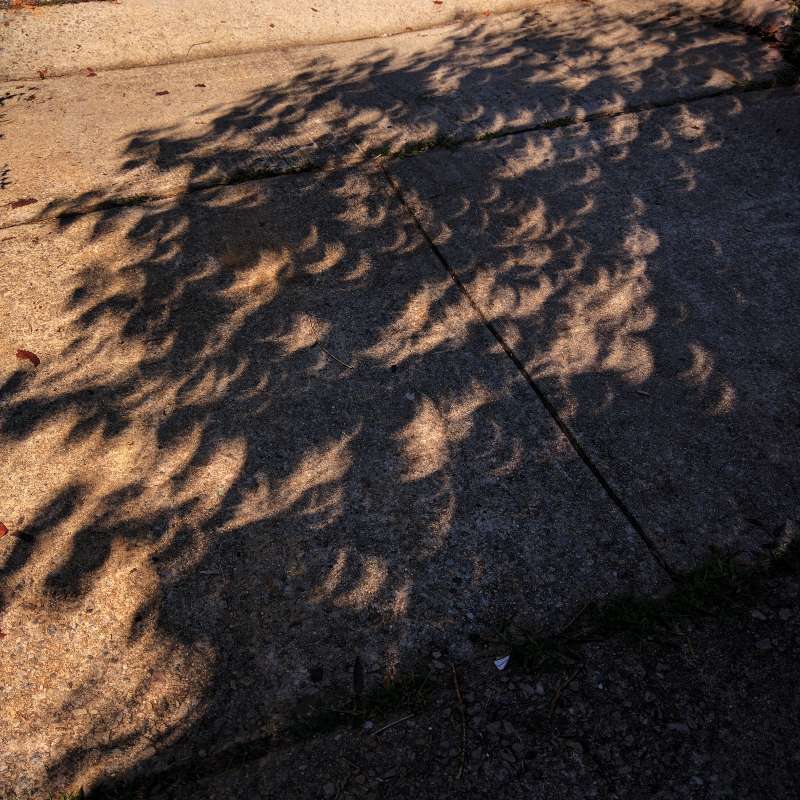 Shadows during solar eclipses are curious. Tiny openings between the leaves of trees act the same way the binocular setup works and effectively project the sun's image onto the ground. The only difference is that the binoculars use lensees to magnify the image with a short focal length and the tree "pinholes" magnify the images according to the proportion of distance of the hole to the ground. 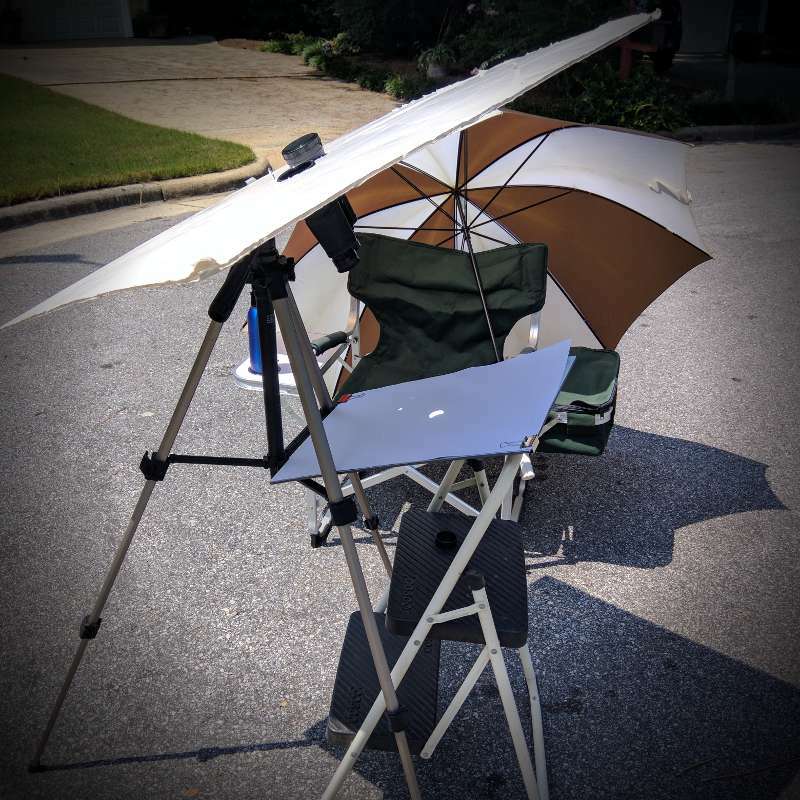 This entry was posted in Passive Design, Triangle and tagged eclipse, passive design, solar design, Triangle on 2017-09-08 by Steve Hall. Today is the summer solstice. This is the longest day of the year, even though the summer is only getting warmer for the next three months. 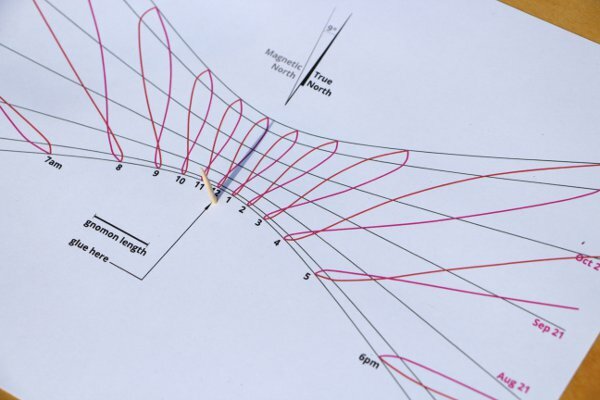 Download my free Triangle Sundial that you can print and test the sun angles yourself. Due to the thermal lag of the earth’s mass, the days will continue to get hotter despite the sun being the highest in the sky today. As discussed in the previous article, using solar angles can be very helpful for reducing energy costs in architect considers them in the design. Of course, the opposite is also true. A home can actually face into the warm summer sun and increase the cooling costs. The sundial illustrates just how much these solar angles change througout the year. Please send me photos of your sundial in action! This entry was posted in Passive Design, Triangle on 2014-06-21 by Steve Hall. My small town of Apex, North Carolina used to be called “Log Pond.” The photograph above is taken down the central Salem Street, the low spot in the road in the foreground apparently the site of the former pond. 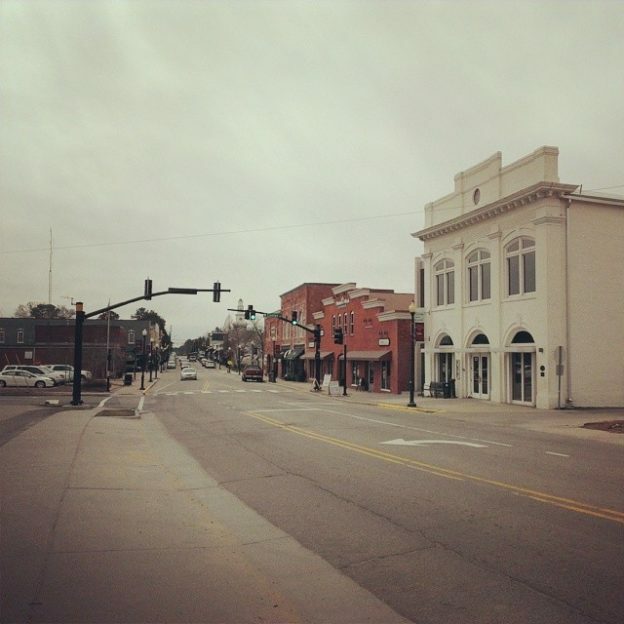 According to the town historians Warren and Toby Holleman, authors of Pluck, Perseverance and Paint: Apex, North Carolina: Beginnings to 1941, it served as the water replentishment for steam trains on the line parallel to the street just a hundred feet to the left. 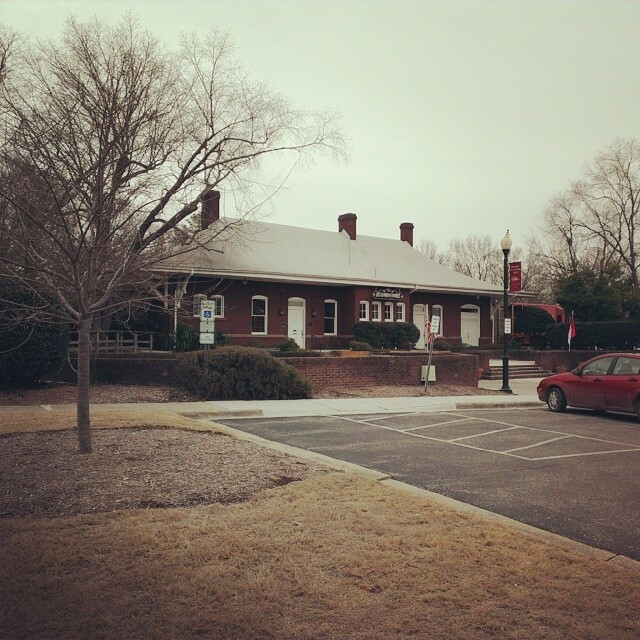 The depot building still stands today, both as a landmark and the town Visitor’s center and Chamber of Commerce. Read more in Apex’s Log Pond, the original article published in Cary Magazine. 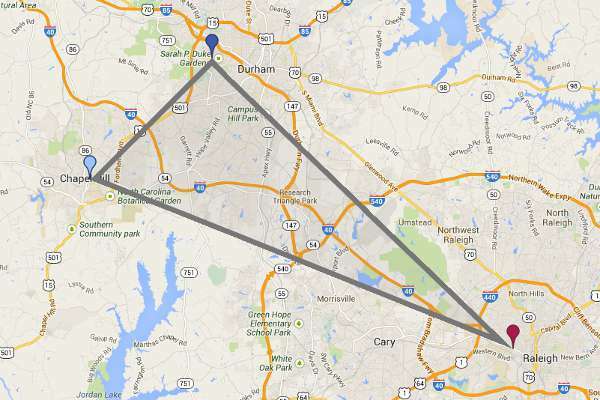 This entry was posted in Triangle on 2014-03-06 by Steve Hall. Today is the winter solstice! It’s a time for optimism—from here on, the days will be getting longer. At 12:11pm EST today, the precise time of the winter solstice, the sun angle is more than 45 degrees lower than on June 21, the summer solstice. Because of this angle, it goes below the horizon earlier than on any other day. Today will be almost 5 hours shorter than the summer solstice. These two simple factors, the sun angle and the length of day, have impacted building design since Woodhenge (Stonehenge’s little brother). I’m probably a bit of an astronomy fan because of it. The solstice reminds me of extremes, how buildings are deprived of heating sunlight during cold winters and subjected to an enormous amount of heating radiation during hot summer days. The astronomical reality makes quite the impact on energy usage and utility bills during both seasons. Especially when it isn’t considered. 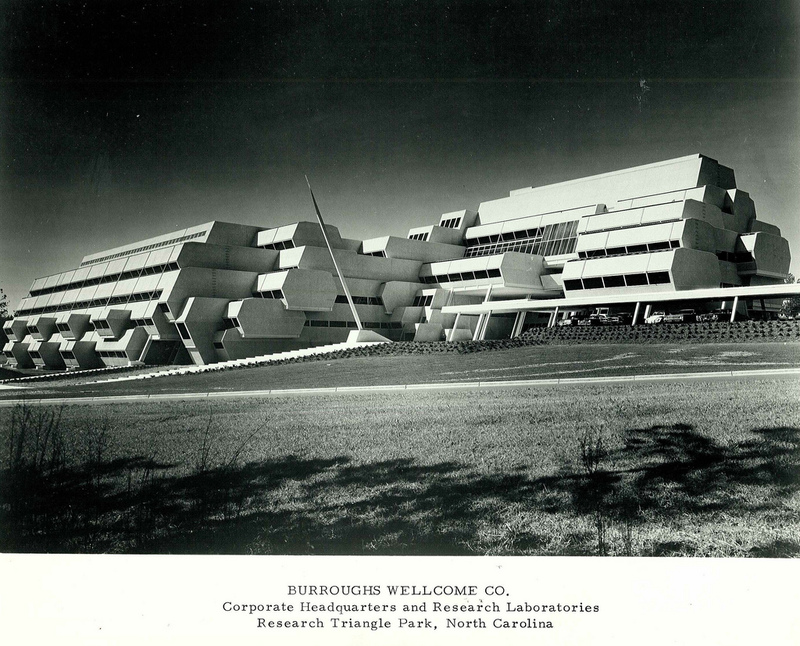 Fortunately, we can design the building envelope to use solar angles in our favor. Simply considering them can both inform design, make more comfortable spaces, and save energy. Since the passive energy design studio I took from John Nelson at UNC Charlotte back about 1988, it is interesting to see this correlation play out in practice. I strongly recommend Sun, Wind, and Light: Architectural Design Strategies by G. Z. Brown for anyone interested in an introduction to these environmental design concepts. As a personal example, aiming a heavy brick screen with small punched windows toward the southwest in my design of the medical office building resulted in HVAC equipment an entire size smaller. So it saved money on the construction of the building as well as all future cooling costs. Plus the smaller windows reduce the southern glare for the occupants inside. That’s a lot of wins without any drawbacks just by considering the sun at the beginning of design. Today makes a great day to illustrate exactly how low the sun really is—with an accurate sundial. 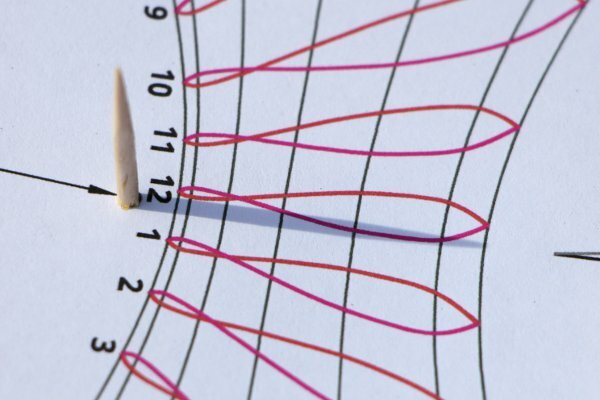 The typical sundial can be inaccurate up to one or two hours depending on several factors. So I designed one inspired by the Brown book1. Finally, it is set to Eastern Standard Time. The United States has been adopting some form of clock adjustment since World War 1 in the implementation of Daylight Savings Time. This means that from March 9 and November 2 you’ll have to add an hour for the dial to read correctly. One final tip: For accurate readings, the sundial must be dead flat and pointed toward true north, as in the North Pole and the North Star. But not magnetic North, such as with a compass or smartphone, because here in the Triangle it will be 9 degrees farther left than true north due to magnetic declination. This is the considerable gap between the magnetic axis and the rotational axis of the earth, which can equate to about a month and an hour to a sundial. Download my accurate Triangle sundial (PDF, 123k). 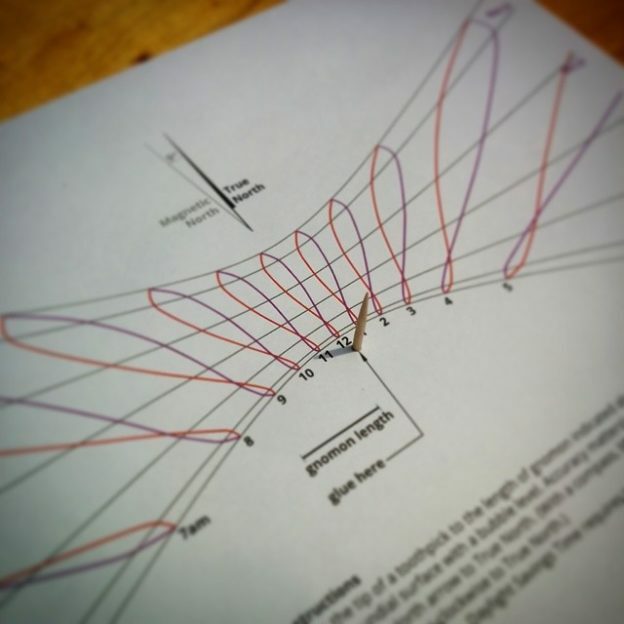 Cut the tip of a toothpick to the length for the gnomon indicated and attach. In March-October, subtract an hour to correct the 1 hour addition by Daylight Savings Time. Accuracy is affected by the length and straightness of the gnomon, the levelness of the dial, and how close alignment is to True North. Please comment below or contact me if you can’t figure it out, I’m more than happy to help! My sundial calculations were generated with the Sundial Program from the University of Oregon Solar Radiation Monitoring Laboratory. Smartphone apps can work in a pinch, but a true level is more accurate. Same goes for the compass. I recommend the Swiss Army Knife on Android for the phone. Please send me an email or comment below to recommend a good one for iOS. 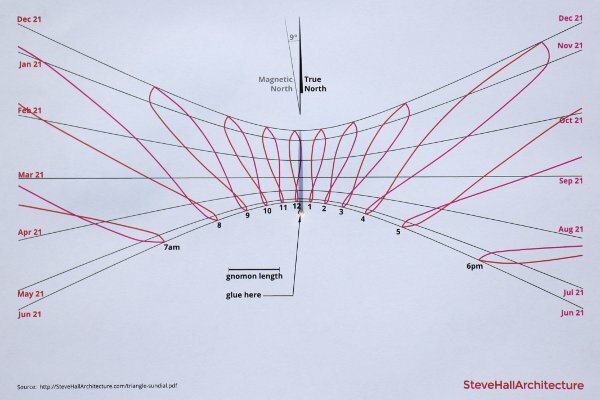 This entry was posted in Passive Design, Site Planning, Triangle and tagged passive design, sundial, Triangle on 2013-12-21 by Steve Hall.